Let Σ be a combinatorial surface with n vertices, genus g, and b boundaries. Amen. After putting together my graph of SOCG submission data, I thought it would be interesting to see the corresponding graph for the other primary conference in my field: the ACM-SIAM Symposium on Discrete Algorithms, colloquially known as SODA. So here it is (also in PDF). Most of the data comes directly from the acknowledgments pages of the proceedings, but I had to fill in a few missing details (short paper submissionss from 1999 and 2000) from the excellent presentation by the 2005 program committee chair Adam Buchsbaum. I could not discover how many papers were submitted in 1994 or 1995; the points on the graph are pure fabrication. If you know these numbers, please tell me! From 1999 to 2005, the SODA call for papers solicited two types of submissions: standard ("long") papers up to 10 pages long, and short papers limited to 2 pages. (The call for papers for SODA 1999 explains the difference.) Despite their obvious succcess at attracting more submissions, short papers were, to put it mildly, controversial. Their continued existence was a topic of endless and rancorous discussion at every business meeting between 1999 and 2005. Despite an almost constant number of submissions each year, their acceptance rate decayed very quickly after their first year, to just over 10% in 2005. The SODA community voted to eliminate short papers at the 2005 business meeting. At least since 1993 (the first year I attended), SODA has always had parallel presentation sessions. The conference organizers expanded the program from two to four parallel sessions in 1999, the first year that the program included short papers. The change was not popular; since 2000, the program has had three parallel sessions. The drop in acceptances in 2000 appears to be reflected in a temporary drop in submissions in 2001. Except for the drop in 2001, there appears to be very little correlation between the number of papers accepted in one year and the number of submissions the following year. 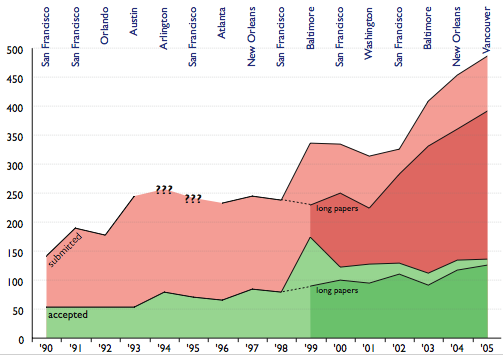 Between 1993 and 1998, submissions were fairly constant but acceptances rose very slightly. Since 2001, acceptances have been fairly constant but submissions have been rising steadily. Since 2001, the number of (long-form) submissions began steadily increasing at a rate of 40-50 papers per year. The recent increase in SODA submissions is consistent both with SoCG and with other computer science conferences over roughly the same period of time. The field is growing quickly. Despite this growth, there is heavy resistance in the community to expanding the conference program (via more parallel sessions, posters, or any other mechanism). Originally I also intended to graph the number of computational geometry papers appearing at each SODA. Fortunately, I quickly realized that would be way too much work. Excellent graphs both. on a side note, what program were you using to make the pics ? The graphs are "home grown". I graphed the raw data in an AppleWorks spreadsheet, imported the graph into Adobe Illustrator, and then made it look good. Yes, SODA is growing signifcantly faster and more steadily than SOCG. There were 106, 104, 118, 147, and 141 papers submitted to the last five SOCGs. That's an average of 9 new submissions per year, or about 7.5% annual growth. Almost all of that increase happened in one year. There were 224, 283, 331, 360, and 392 long papers submitted to the last five SODAs. That's an average of 42 new papers per year, or about 15% annual growth. Moreover, the growth has been steady over the entire 5-year period. If we include both short and long papers, there were 313, 326, 408, 454, and 487 papers submitted to the last five SODAs. That's an average of 43.5 new papers per year, or about 12% annual growth. Again, the growth has been steady over the entire 5-year period. It seems like this info would be great to have in one place for as many conferences as possible, much like this for networking conferences: http://www.cs.ucsb.edu/~almeroth/conf/stats/ Anyone know if such a repository exists? That would be a good idea. The ACM has started maintaining stats for some of the ACM run conferences, and their task force did collect stats on many conferences. With what Jeff already has, adding to this should not be hard. Maybe we need a section on the Theory Matters wiki: arguably this shows the growth of the area and that can only be a good thing.